Not all shelters are the same! Do NOT be deceived!!! What EXACTLY are you buying? What EXACTLY is included in the price others have quoted you? 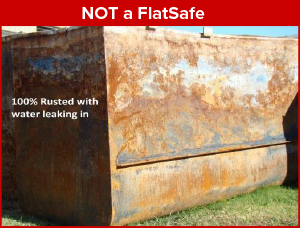 We provide you with several corrosion protection options to protect your investment from rust and leaks. In business since 2003, we offer a 50 year warranty you can count on and transfer to new owner if you sell your house. NOPE! 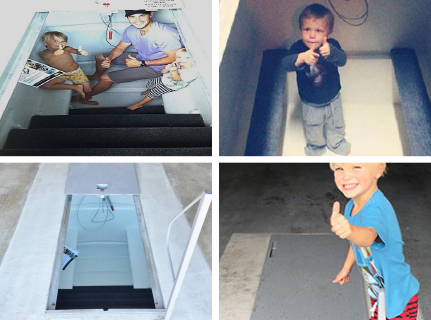 2-piece lid designs can fail to open when impacted or ventilate properly if damaged or covered by debris. 2-piece lids also allow water to run into the shelter. NOPE! Be wary of a “lifetime” warranty. A lifetime of what?……..a “lifetime” of patches when the leaking begins! 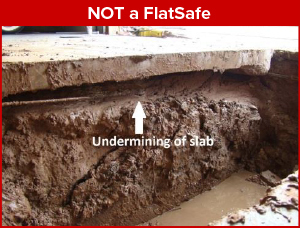 Do NOT buy a shelter that is back-filled with DIRT! 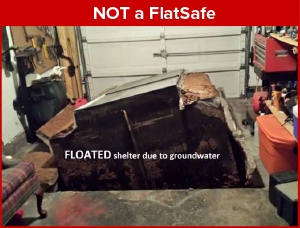 In the video below, Lisa demonstrates how FlatSafe’s patented single lid acts as an eave to help disperse water.